I feel as if my journey with Origin has been a tough one. For starters, it took me nearly a week to finish, which may not seem very long, but for me it is looong. Not only that, but I was completely baffled and utterly torn over what rating I should ultimately bestow upon it. You see, Origin had a lot to love, but it had, in equal parts if not more, aspects of it which I didn’t enjoy. Unfortunately, I feel as if the negative aspects of this novel trumped the positive ones and I am forced to admit that Origin simply did not live up to the hype and could definitely do with a large dose of character-development, romantic flavor, and all-round editing. Pia has grown up in Little Cam, an isolated laboratory in the heart of the Amazon Jungle where she has been created to start a new race of immortal beings. Now a teenager, all Pia has ever wanted is to join the Immortis Team and help create a race of immortals so that she won’t be alone. On the night of her seventeenth birthday, however, when a hole appears in the fence separating her compound from the jungle, Pia’s curiosity, newly instilled by the arrival of a lively new scientist, is aroused and she ventures away from her home for the first time. In the jungle, Pia meets Eio, a native of the forest, and as her excursions to visit him increase, so do the mass of swirling questions in her mind about what lies in the world outside. It is then that Pia slowly begins to uncover the deadly secret behind the basis of Little Cam – one that could change her life forever. I have to admit, I was extremely impressed by the amount of research that Jessica Khoury put into this novel. Not only are her descriptions of the Amazon beautiful, atmospheric, and filled with languid prose, she truly made you feel as if you were there yourself. I love the feeling of becoming immersed within a setting and the exotic – and original – setting of this story has only made me want to go there someday myself. Yet, more than simple research on the habitat where she has placed her characters, Khoury did an enormous amount of research behind the concepts in her novel as well. While immortality remains to be an age-old mystery than mankind has often lusted after, Khoury explains her take on it in a simple and realistic manner, using previous ideals of biology and genetics to make her complex ideas plausible. Yet, despite its authentic premises, the characters and pace of Origin failed to draw me in. In all honesty, I think I truly appreciated and connected with one – maybe two – characters in this entire tale. I feel as if the entire cast of Origin was vastly underdeveloped and those who did have some development, such as Pia, were distant and difficult to connect with. While I appreciated the ideas behind the character of Pia – a living experiment who had never asked to become a test subject but was forced to live with the results of her experimentation – I was disappointed by the execution of her character. Pia has the potential to be such an interesting character and while some of her thoughts and conversations were very deep, for the most part she is indecisive – constantly going back and forth between Little Cam and Eio in the jungle – and for all the desperation of her situation, is difficult to sympathize with. Furthermore, beyond mere curiosity, beauty, and the intelligence that comes from being immortal, I found it tough to really find who Pia was beneath all the labels she carried. I think Khoury tried to half-heartedly develop her in the second half of this story, throwing in situations that showed us Pia’s moral status, her kindness, and humanity, but it didn’t help me connect with her in the least. Thus, while I liked that we were able to see some of the dangerous affects of immortality through Pia, I still don’t feel as if I truly know her – or even want to actually – which prevented me from really enjoying this tale. Now, looking back, my connection with Pia was broken in the first few chapters of this novel itself when I found it difficult to believe that Pia, a teenager who has grown up as a scientist and been raised to ask questions, was never curious about the outside world until the arrival of Aunt Harriet, the new scientist who gifts Pia with a map and encourages her to think beyond the walls she has known all her life. If that wasn’t enough to make me jump on the Skeptical Boat, the very fact that Eio was proclaiming his undying loyalty and love to her after just a few scarce meetings, definitely was. Eio, in my opinion, is the least developed of all the characters and while he did have a few interesting conversations with Pia, for the most part his entire character didn’t serve much of a purpose beyond that of a friend. I didn’t care for the romance in this story in the least and Eio is such a weak character than beyond his kindness and naivety, he is easily forgettable. Other forgettable characters include the scientists of Little Cam. While I found them to be deliciously evil, there wasn’t much to them beyond their inherent badness, which I disliked. I wish that the small bout of corporate/scientific politics that was thrown into this tale had been better developed and built around the personalities of the scientists that Pia grew up with, but instead these characters were simply written off as being greedy, corrupt, and power-hungry, which was a mistake as I am sure there is much more to them than just that; yet, we were unfortunately unable to see this side of them. Origin, while not being a tale I would recommend to others, is, by no means, a bad novel. In fact, many of my most trusted reviewers have given this story high ratings and I am glad that they were able to fall in love with this unique story in a way that I wasn’t. For me, more than the slow pacing and bouts of extreme animal cruelty that tainted the pages of this book, the characters were a deciding factor on my negative rating. I simply did not enjoy reading this and while I was pleasantly surprised by the plot twists at the end, by that time it was simply too late to make me appreciate a story in which I didn’t feel anything for the characters or the difficult situations they found themselves in. 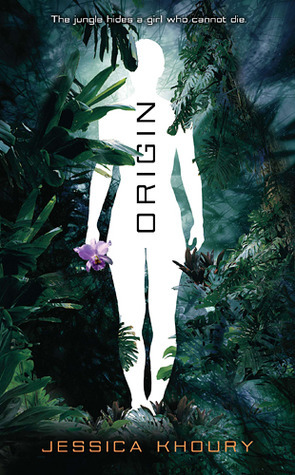 As far as debut novels go, Origin is teeming with possibility and promise, but it simply fell flat in my opinion. Yet, I am quite confident that this is a story I will be seeing on many favorites shelves before the year is up. Once again, I seem to be the exception, not the rule, of general hype. I love character driven stories, so I don't think this is one for me. A shame really because the blurb's interesting; don't have time for a 50/50 type of book at the moment - but I might get it out of the library in the future purely to get a feel for the premise. :'( I was so excited for this book! I am actually meeting the author at a major book festival in September. While I still think I'll buy this book, just to have it signed, my expectations are much lower than they were before. This was one of my most anticipated this year! But I think I understand why you didn't like it. Pia seems pretty dull, and the romance just seems bleh with a capital B. However, the setting does sound enchanting! I'm sorry this didn't live up to the hype for you, Keertana! Hopefully, with lowered expectations, I'll enjoy this one more than you did. Ahhhhh. I'm so sad to hear you didn't quite connect with the characters. That tends to be my problem with a book, if I don't like the characters, I won't like the book and this book looked so awesome and I really wanted to read it. I might have to hold back now, since I'm not so sure I want to read it! Thanks Olivia! (: I'd definitely love to see what you think of this one if you choose to pick it up. I think my lack of connection may have just been a problem for me as I know many readers who loved it and the cover really is gorgeous, so I hope you still give it a try!